Appliances that store or use water in the home are a serious risk for damage from leaks or spills. A drip tray is a cost effective and simple solution that helps reduce or even eliminate the risk presented by appliances. In this resource we will discuss what to consider when designing a drip tray for a Washing Machine. The most common drip trays available from large box stores and hardware suppliers are plastic or a pressed, thin metal material. The reason for the popularity of these materials for drip trays is their cost. Molded plastic and press metal pans are cheap to make. Unfortunately, the truth is the truth, and you get what you pay for. A cheap drip tray is often inadequate for the job it is intended to do. So consider this, will your Washing Machine Drip Tray experience changes in temperature? Will it be kicked or accidentally have things fall on it? Will you want your drip tray to last longer than 1 year? If you answered yes to any of these, consider using a material stronger than plastic and sturdier than thin pressed aluminum. A Washing Machine can leak in many different ways. A failure in the machine’s drum (where the water and clothes go) may cause a continuous or temporary leak. A failure in the water supply lines will cause a continuous leak. Failure in the Washing Machine drain will cause a temporary leak issue. Even removal of the clothing causes some leakage if the clothing is not fulling spun. If you intend to protect against all types of washing machine leaks you will need to allow any leaking fluids to drain out of the drip tray through a drain hole into a pipe. In this manner you will control the leaking water and get it out of your home without it damaging the floor or walls. If your Washing Machine Drip Tray is not equipped with a drain hole, it may still be useful in protecting against non-continuous leaking accidents. Killarney Metals can make a great looking drip tray. Our brushed stainless steel drip trays are fit for the most luxurious of laundry rooms. However, there is an expense to this type of material and finish. If your washing machine in is an area that is not readily visible or does not require a drip tray with a high cost finish, we suggest going with a lower cost steel such as a galvanized drip tray. At Killarney Metals, our galvanized drip trays have the same quality craftsmanship built into them, but the steel material is not as expensive as the stainless. Whether you need a drip tray that enhance decor or a tray to put in the laundry closet, we have the right washing machine drip tray for you. At Killarney Metals we suggest using a drip tray size that is at least 1 inch greater on all sides of your washer for general sizing purposes. However, if you are using a drip tray and intending it to hold a fluid volume similar to that of your washing machine you will need to give more thought to the size of the pan. You may want to view our Drip Tray Calculations Resource. 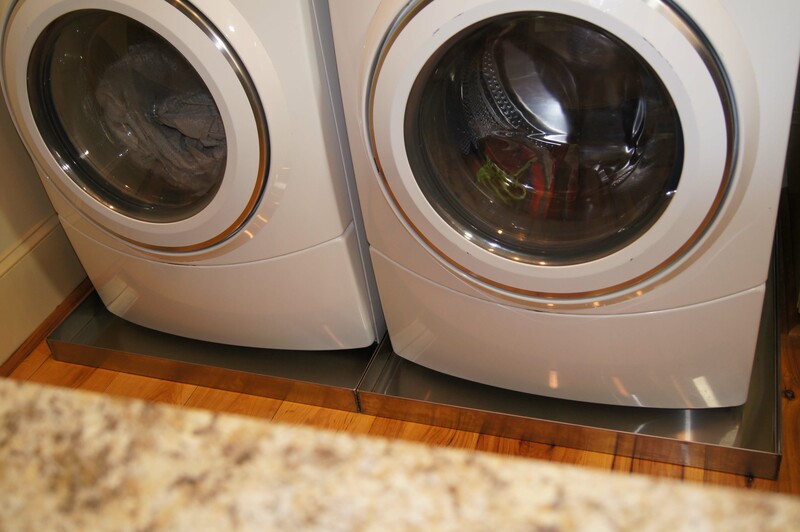 When sizing your Washing Machine Drip Tray keep in mind any obstructions such as walls, cabinets, piping or pedestal drawers that may interfere with the installation of the drip tray. You can view our Washing Machine Drip Trays here and remember that we can make a custom tray just for your requirement if you desire.